Globally, programmatic advertising has been remarkable in the online advertising industry. Programmatic is a term still new in India with a very few ad tech companies using it to provide services and solutions to their customers. Many companies in India are still practicing the traditional mediums to advertise online, which does not serve the purpose for their advertisers as the viewers watching the ads may not always be their target audience. 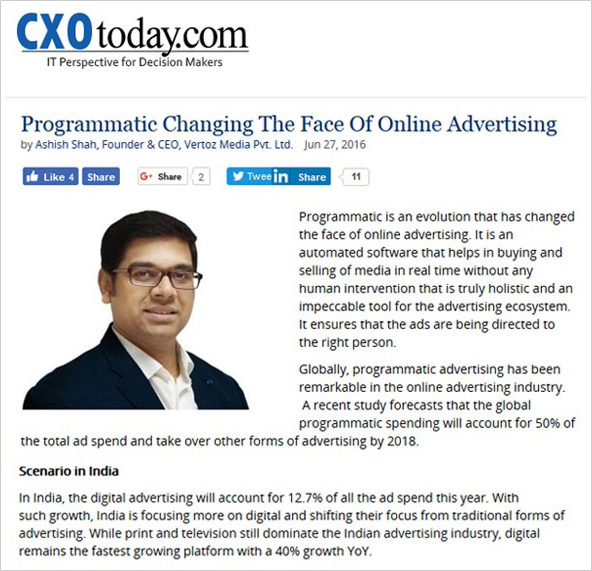 India will soon adopt programmatic advertising, replacing the traditional digital mediums and will be able to serve the advertisers and publishers with better targeting and analytics and performance tracking. CXOtoday.com is a uniquely Indian perspective on the domestic IT Industry that keeps the Indian CXO community updated on the latest developments and their implications. They are always the first to cover the developments across varied IT segments with the fastest coverage of the latest happenings in the industry. We are among those ad tech companies where we empower a global roster of top advertisers and publishers all under one roof. When we talk about programmatic advertising technology, we cater out best ad buying systems. Thus, we are helping more and more people to opt-in and try out digital advertising in this industry. People will soon start embracing programmatic and benefit from it. We provide you with better targeting along with tracking performance and analytics.